Brookfield Renewable Partners (BEP) is one of the largest pure play renewable energy companies in the world, with a 100 year history in hydroelectric generation. Their hydro and wind power facilities are in both North and South America, as well as Europe. As both owner and operator, they gain a unique perspective allowing them to generate attractive total returns over the long term. BEP was launched in 2011 and is the second business platform spun off from Brookfield Asset Management’s (BAM’s). Assets owned directly by BAM and others managed as part of a separately traded hydroelectric fund were combined to create Brookfield Renewable Power. On launch, BEP became the world’s largest publicly traded (hydroelectric power) generation company. I happened to own both BAM and the fund before the spinoff and remain enthusiastic about the new company’s prospects because of their two wide competitive moats. Since their launch, BEP has grown considerably, increasing power generation from 5,800 to 10,700 megawatts (MW) of capacity, and their assets under management (AUM) increased from $17 billion to $25 billion. They’ve expanded from 70 to 82 river systems, 187 to 260 power generations stations, and 11 to 15 markets in 7 countries. BEP has been built over the years around two durable competitive advantages, or “moats”. The first moat is a tremendous power generation cost advantage. Power generation is a very energy-intensive business. BEP’s renewable energy has an inexhaustible and free fuel supply (rainwater and wind), producing the lowest cost electric energy available. Mother nature provides the second moat with the limitations of suitable river locations for hydroelectric dams, sufficient water volumes when locations are found, and competing recreational uses for rivers. In the U.S. for example, only 6% of the electric power in 2015 was from hydroelectric sources. This low volume of efficient power attests to the limited availability of locations. Limited availability of locations for competitive use forms the second moat for BEP. Approximately 88% of BEP’s power is from wide moat hydroelectric power generation. The remaining 12% is primarily wind generated power. The company enjoys stable cash flow with 90% under contract and a weighted average 16 year contract duration. Is a Competitive Moat Important? A company we’re capable of understanding. A durable competitive advantage or moat. Management with integrity and talent. Priced low enough to provide a margin of safety. I’ll discuss point two; the durable competitive advantage or moat in this post. The remaining three points on the checklist will be examined in our next post on BEP’s valuation. Electricity is a commodity where prices are set by the high cost marginal producer in the industry, according to economic theory. During periods of high demand, low cost producers generally run up to full capacity. Then the next highest cost producer comes on line, but requires a higher priced production. This continues until the last increment of demand is satisfied by the marginal cost producer. During periods of low demand when prices weaken, the low cost producers can outlast the higher cost producers. Eventually the higher cost producers reduce production or leave the market until supply meets demand. The low cost producers are best positioned to run at capacity and enjoy the higher prices when demand increases. Low cost producer’s margins are not immune from commodity price weakness. In the U.S. for example, the high cost producers historically have been fossil fuel steam producers using natural gas, coal and oil electric generation. In recent years the decline in natural gas prices lowered the cost of marginal producers resulting in lowered electrical prices. All producers, even the low cost ones, must meet the lower prices to remain competitive. How Significant is BEP’s Advantage? The graph below shows operating expenses for electric power production in the U.S. during 2015, as reported by the US Energy Information Administration. It shows the tremendous 2.4¢/kWh economic advantage of the hydroelectric producer compared to fossil fuel steam producers. Today hydroelectric generators produce electricity at about 40% the cost of the gas turbine generators. If one believes natural gas prices will rise over time, this advantage will increase. The table below shows in 2006 for example, when natural gas cost $6.75 per million BTUs, the advantage was about 90%. This advantage will only increase over time as natural gas prices increase with increased demand. 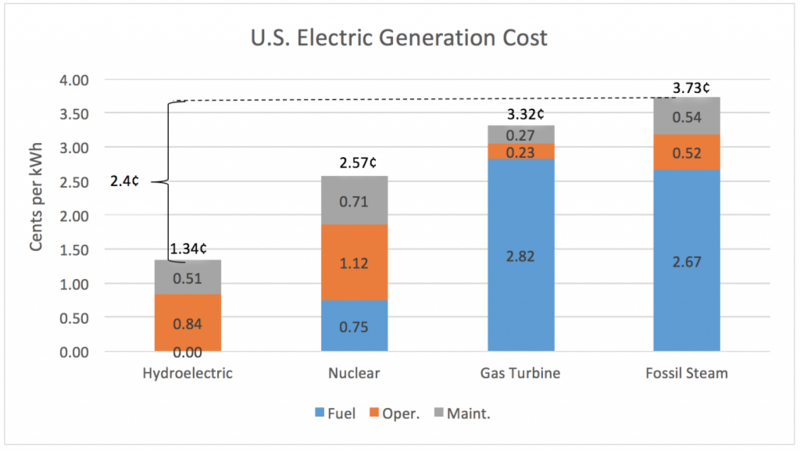 An increase of $1.00 per million BTUs in natural gas price (from the 2015 levels) would increase Gas Turbine generating costs 32%, because fuel makes up 85% of the Gas Turbine operating costs. Hydroelectric generation would not change all other things equal, increasing the hydroelectric generator’s advantage. Gas Turbine is the primary source of new electric capacity as carbon emissions continue to be a major headwind for fossil steam producers. Meanwhile nuclear plants continue to be shuttered. Gas Turbine generation is viewed as an environmentally friendly and efficient alternative to the marginal fossil steam producers. Still, hydroelectric retains its tremendous cost and environmental advantages over the alternatives. With Limited Locations can there be growth? 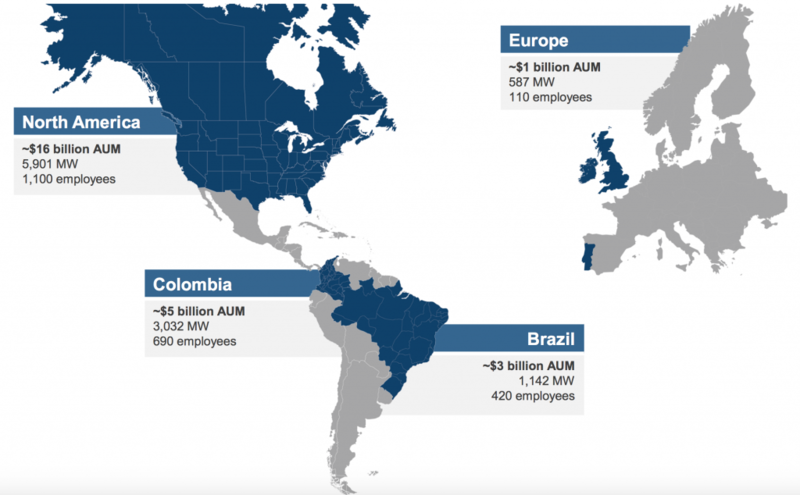 Brookfield Renewable Power’s global footprint provide opportunity for growth around the world. In emerging markets like Central and South America, for example, the middle class is growing. As the middle class grows with economic development, demand for electric power follows. BEP owns and is constructing renewable generation capacity to meet this growing electric power demand. BEP’s capacity increased significantly since the launch in 2011 and remains protected by two protective moats: low production cost and limited locations. In the next post, I’ll discuss why I’ve been satisfied with BEP, the valuation, and how their prospects might improve over the next few years. Until then, check out some posts like this one about Brookfield Infrastructure Products Valuation.